Sometimes a child is found in the lower half of a belly. The one that comes out is a man. Stomach churns. There’s bile in your mouth. You become beautiful. You become a queen. At all other times, a miracle: you are mother earth, you sprout seeds, roots and shoots and leaves, and then, perhaps, flowers and fruits. It seems I am of the second kind. I am Treeman Chipotle. Come here, look at my hands, you haven’t touched them. I can imagine swings tied to my hands, I can imagine not one but two of them, three, with children sitting and swaying. I breathe and they sway. I breathe and they sway. I do not breathe too heavily for fear of breathing them away. I do not breathe too heavily so that I do not hurt them. I breathe gently, I can almost count my breath. I cannot heave a sigh of relief, but feel I am present here, now. It is a pleasant feeling. I came into this world, I think, thousands of years ago, but have only started to be here. The index finger of my right hand has been itching. If you were me, you would think this means you will make a lot of money this summer. I feel I will sprout a leaf. It has been itching to come out. But I am only speculating. I have only been speculating about my body. This is partly because I cannot move my head as much as I once could. I do not trust mirrors. They are never enough to make you see. Hands, strong, do not move at the same speed. It is a peculiar problem–I can feel and not feel my body. I think this happens to everyone. It is as if you are in a deep sleep and you can feel your inside. You can feel your yearnings, your fears. But you can only hope to feel yourself from outside. Don’t believe those who tell you either of these feelings are unnecessary. Don’t believe those who tell you, you can exist entirely inwards, that beauty is all that is inside. What do they know? You must already be aware of the treeness that affects one’s ability to move. It affects one’s memory too. But I remember, I remember that I am Treeman Chipotle. Come here, I will tell you stories. Stories of how it all started. Stories that I haven’t told anyone before. Stories that you would not know. I do not know how and when it happened, the precise moment that brought this on. I have wondered if I was always a tree. I breathe at night, I would say, always. This way, deep breathing, except for when children are swaying on the swings. I remember talking to Leela one evening after dusk, on another morning talking to Lalit about reproduction. We wondered if touches could make one pregnant. Later we wondered if one sucked on your breasts long enough, regularly, would you become a mother? We wondered how it would be to see your breasts develop and how it would be to live with an unwanted protrusion. What would people say? Will they laugh or will it make them happy? As a discussion must end for another to start, we would settle for this: if anything, only thoughts can impregnate. We do not think ill of someone, fearing that ill will happen to us. We do not think of food when we fast, fearing that our wishes will not be granted. We do not think of embraces, we do not think of swaying, we do not think that is why we live. We live a little every day. If you are to go on living like this, if I could point a finger at you, you must not think. Unthinking brings you back on earth, unthinking makes you stay. Thinking is the work of the devil. Daydreaming takes you to faraway places from where there’s no coming back. From where even if you come back, you come back not as you, as you were then. You are lost in the going and coming. I should have known better, you would say. I should have known better those days while idly thinking and biting my fingernails and thinking of another person’s face on mine. The days spent idly smiling and making faces and thinking what if my face did not look like mine and looked like another’s, would they smile this way, would they make this face while biting their nails like me. This would of course end in shame and worry. But those days, I did not know. We do not talk about these things. How do we know? What do we call an immobile, unthinking thing whose body acts entirely independent of itself? A vegetable, said a teacher once, when we could not come up with an answer. I remember it was Lalit or perhaps it was Leela to whom the teacher was referring. What do we call an immobile, unthinking thing that does not know it is sprouting a leaf, but can only wonder? Me. My answer comes quickly without the intended pause of someone who knows. I am Treeman Chipotle. Come here, I will tell you how I perform charity. My right hand does not know why my left hand moves. My left hand does not know that the right is itching, that it will sprout a leaf. Before either of them know, before I know, I will sprout a flower. It will bloom when the season comes. It will attract the insects, the butterflies, the bees. The function of flowers, I am told, is to be the agent of attraction. If allowed, a flower might become a fruit. A fruit might be born when flowers meet. The cycle of attraction continues. The flowers attract insects and humans. The fruits attract animals and humans; they attract insects in decay. It is said a fruit wants to be devoured as a whole. It seduces so that there are more trees. I remember the purpose of life is reproduction. If I were given a choice I would become an avocado tree. I remember a feeling of longing that does not leave or depart. It arrives frequently and stays for three or four days, soaring at nights. I remember that in those moments I am an avocado tree. An avocado tree waits and waits. An avocado tree is out of place in history; it does not belong where it stands. It waits for the beasts that are long gone. Only they could swallow an avocado with its seed: gomophotheres, ground sloths, toxodons. We think the avocado tree does not know that it has been thirteen thousand years since the beasts are gone. We think the avocado tree does not want to adjust. But we do not know that the avocado tree does not know. Come here, I will tell you. If trees had a choice, would they be trees? 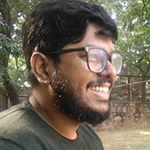 Debojit Dutta is a writer and editor based in New Delhi, India, from where he co-runs the literary webzine Antiserious. His works have appeared in Himal Southasian, The Bombay Literary Magazine, The Missing Slate and other places.